The Helios Fieldmaster 12x50, provides a high magnification with a reasonably bright image (unusual for high magnification binoculars with only a 50mm objective lens). The 50mm objective lens makes the binoculars not too heavy to carry around. All feature BaK-4 prisms and multi-coated optics All have fold back eyecups for spectacle wearers, tripod bush (requires L shaped bracket to mount to tripod) are supplied with strap and case and have a 1 year manufacturers warranty. 03/12/2008 14:58:03 I am an aircraft enthusiast and would appreciate any ideas for replacing my current binoculars. The Helios Fieldmaster seems to fit the bill, but, do you have any suggestions? A lot of it depends upon where the aircraft are being viewed, sometimes (actually usually!) at airports the aircraft can be miles away! A 12x or 16x is the right sort of magnification for most airports and even in flight good views can be had. The higher magnifications are handy for very high altitude viewing (30,000 ft) and many people prefer even a large pair of 20x80 than having a scope (which really do give a good look at the high flyers, but need tripods etc). Could you tell me the eye relief for these bins and the colour of their coatings, please? 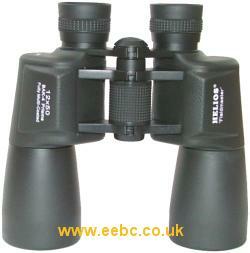 08/02/2012 09:15:53 The manufacturers do not specify the eyerelief on these binoculars. They do have fold down rubber eyecups which are normally about 5mm high and fold back flush to the eyepieces. The coatings are blueish on the objective lenses, and greenish on the eyepiece lenses.